You can also see Week 1, Week 2, Week 3, and Week 4 if you need to get caught up. The challenge for Week 5, was Danse Macabre, The Dance of Death unites us all. To see all the amazing art CLICK HERE. Halloween has come and gone. The Ancestors are about and will continue to prowl the night until the Wild Hunt at Yule. It’s a time for family, both those still with us and those who have past. With the end of October comes the end of the Month of Fear. I didn’t get to participate in as many challenges as I wanted to, but it’s been AMAZING seeing all the art my cohorts have made this month! Really stunning (and creepy) stuff! Again in no particular order. Selected simply because I like them and felt inspired to write about them. Done in Graphite. I love the composition and mood. Such a graphic and well rendered piece. Nice work Babs! I feel like I feature Ashley’s work almost every week, but I just can’t stop! She keeps making awesome art. Once again an amazing piece from Ashley, done in chalk pastel with a dash of photoshop. Wonderfully graphic representation of “The Red Shoes” story. Done in brush and ink, ink wash, and watercolor. Gwenevere captures the classic story in a way that makes it extra creepy. Nicely done! Nice little oil painting by Eliot Lang. The color transition from the dancer to the red jaw bone is really well handled. Cool concept! Done with charcoal. I love the emotion in the woman’s face. 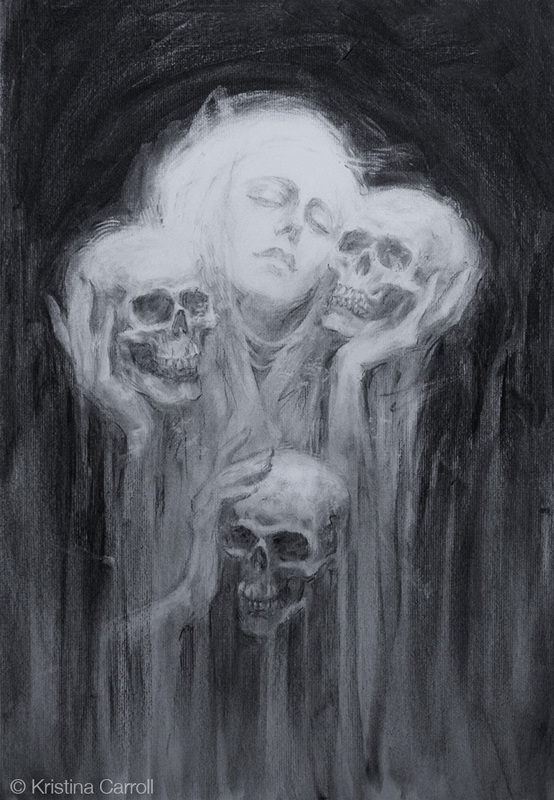 I also love skulls, so of course this piece speaks to me. Wonderful drawing by Kristina! 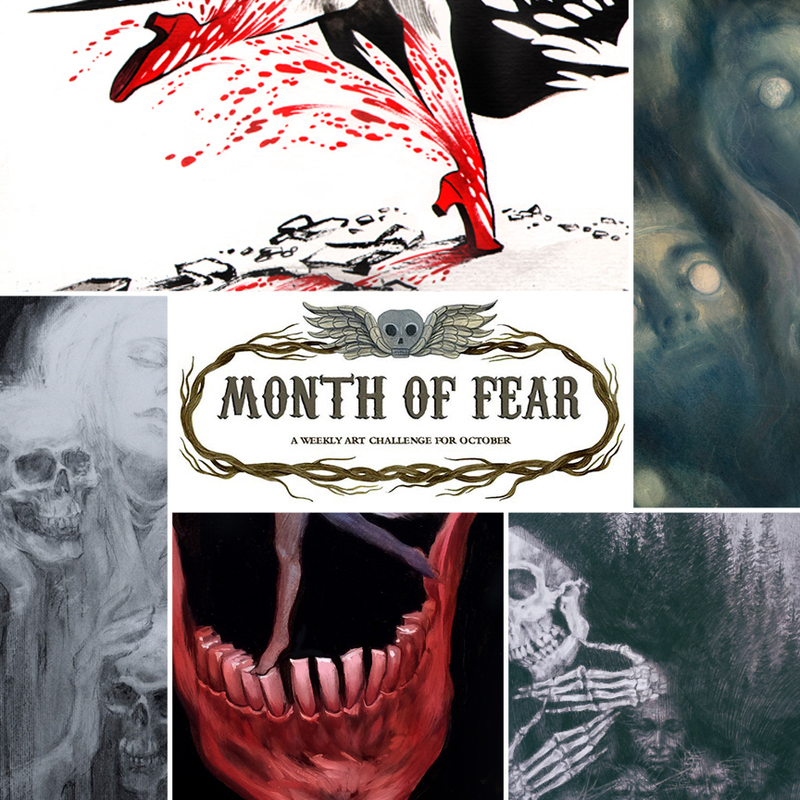 And that’s the end of the Month of Fear! A BIG THANKS to Kristina Carroll for putting together such an amazing group of artists. If you want to hear her talk about it she will be on my show One Fantastic Week to talk about it tomorrow. Tuesday Nov. 3rd at 10AM Central. HERE’s the LINK to watch it LIVE.